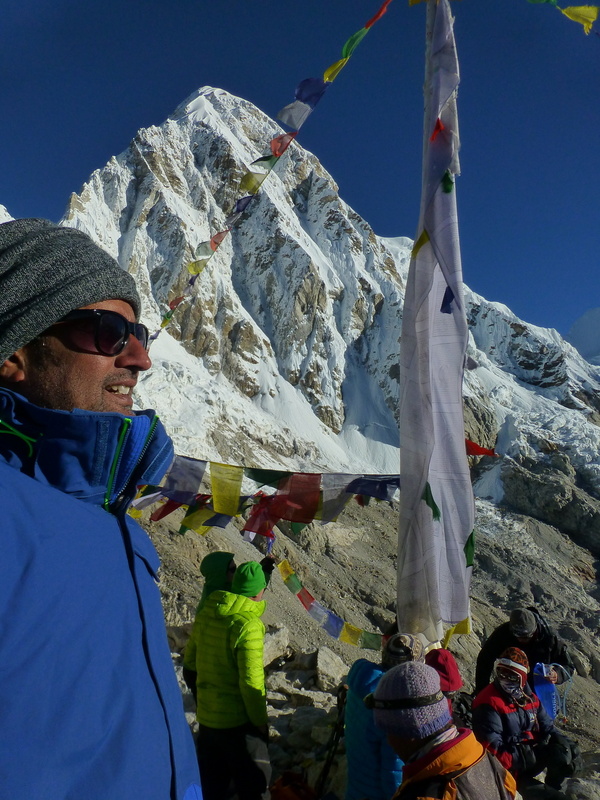 The most boring part throughout the EBC trek for me was to survive through all the sleepless nights. Two or three times during such night, I thought about going out and setting up my camera in time-lapse mode to take photos of the stars and mountain but the sky was not clear and I was afraid of rain ruining my camera. I thought about reading but didn’t have any thing interesting to read (beside my camera manual – which I read during my long flight from San Francisco to Kathmandu via Dubai). Kala Pattar trail head from Gorakshep. 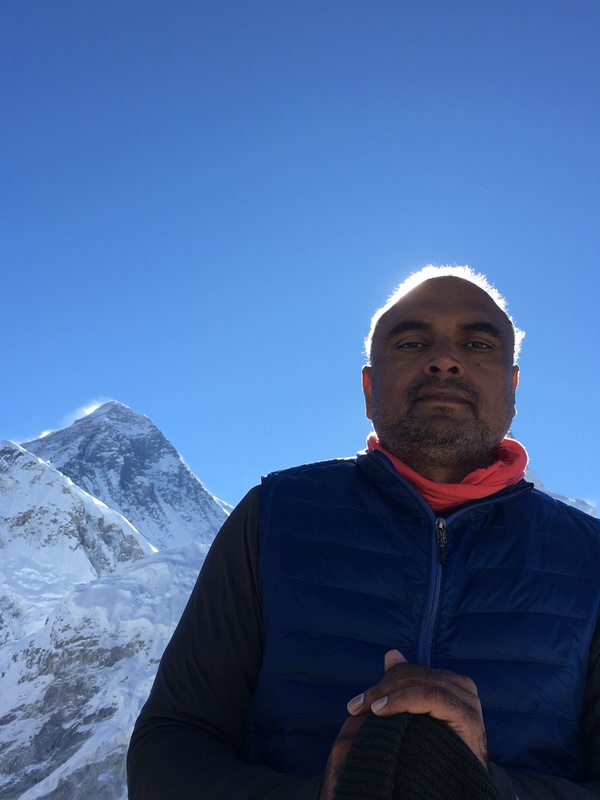 I had brought a couple of books but had to leave them in Kathmandu because of the weight issues for Lukla flight – and beyond. I have seen books lying around at some teahouses early days of the trail but not any more. Throughout the night, I am meditating, making bathroom runs, or waiting for the daybreak so I can have a cup of some warm beverage and hangout in the dining room. The only thing worked for me for peacefully surviving the nights throughout the EBC trek was mentally reciting Gayatri Mantra. I have been practicing Gayatri Mantra Japa (recitation) for years so it could be that it brought some familiarity to unknown surrounding and distracted my mind enough to help maintain my sanity. 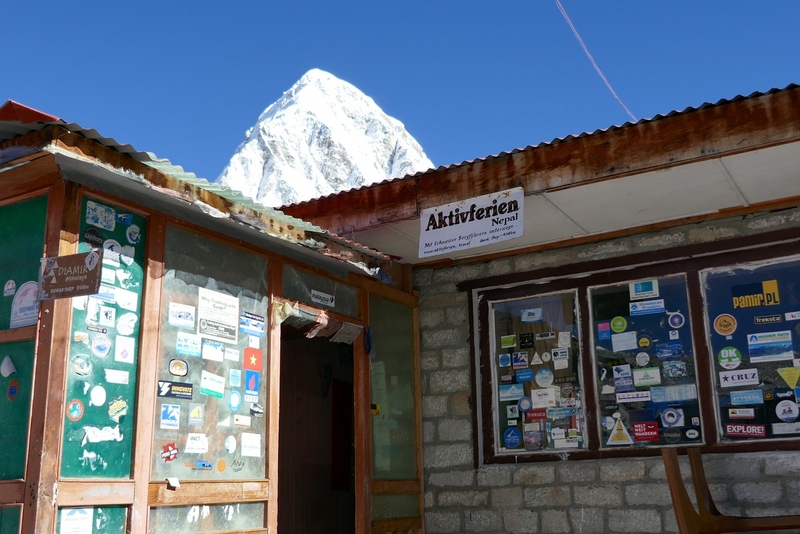 Kala Pattar (also spelled at Kala Patthar) literally means Black Rock in Nepali, Hindi, and several other languages from Indian sub-continent. 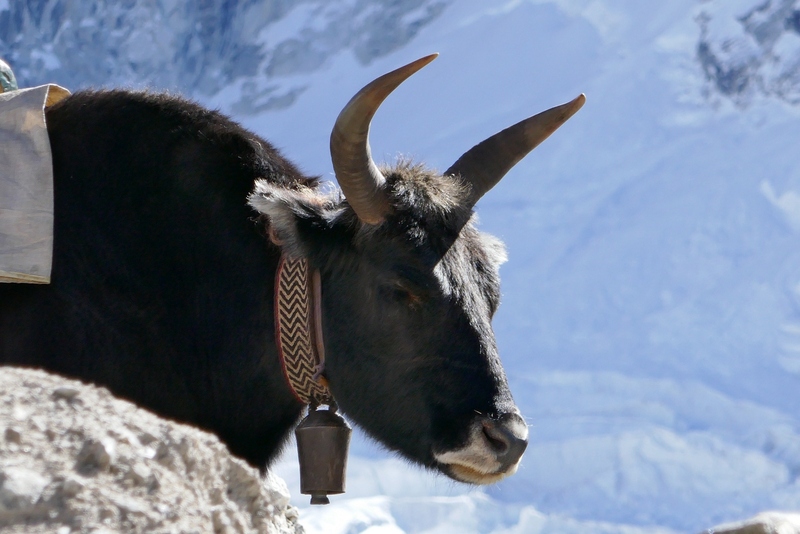 It is easily recognized by its dark black color contrasting with the snowy white Pumori behind it when approaching Gorakshep. 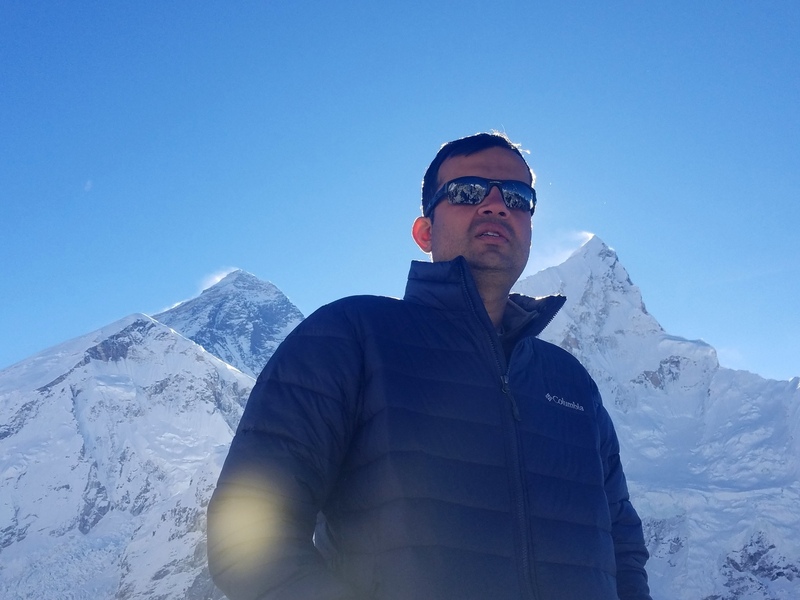 Kala Patthar is not a very scenic mountain itself but it is perhaps the best location to view Mount Everest without doing any technical climbs. 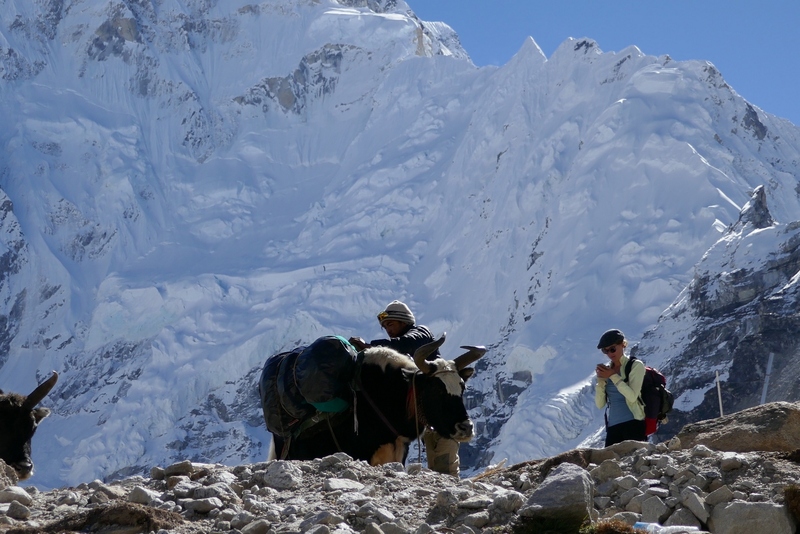 Because the way majority of the EBC trek itineraries work, the trek to the base camp is done the same day you arrive from Lobuche and Kala Patthar hike next morning before leaving Gorakshep. 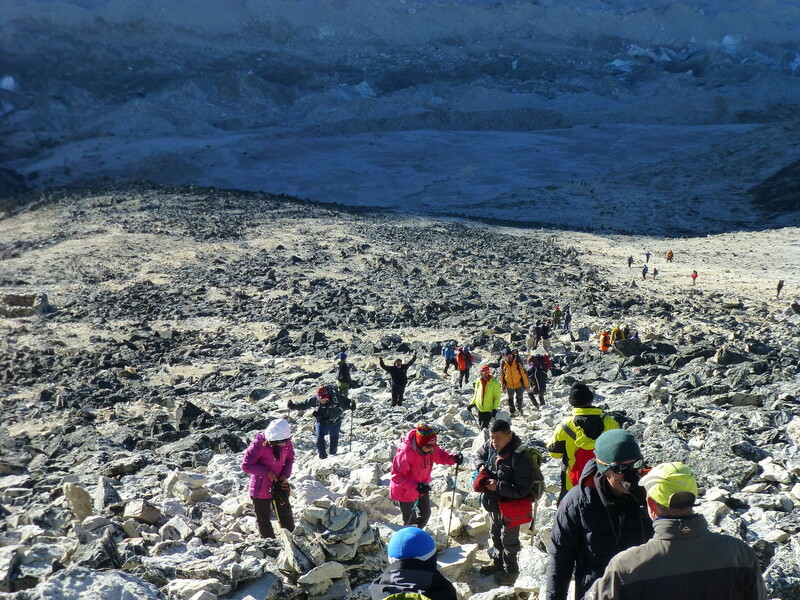 Some people had suggested to do it the opposite way, visit Kala Patthar during sunset the day you arrive and the base came next morning. Viewing Mt. Everest during sunset works the best for photography as the sun will be behind you when you look at the Everest from Kala Patthar. The only problem with this scenario during October/November trek is that clouds covering the mountains. 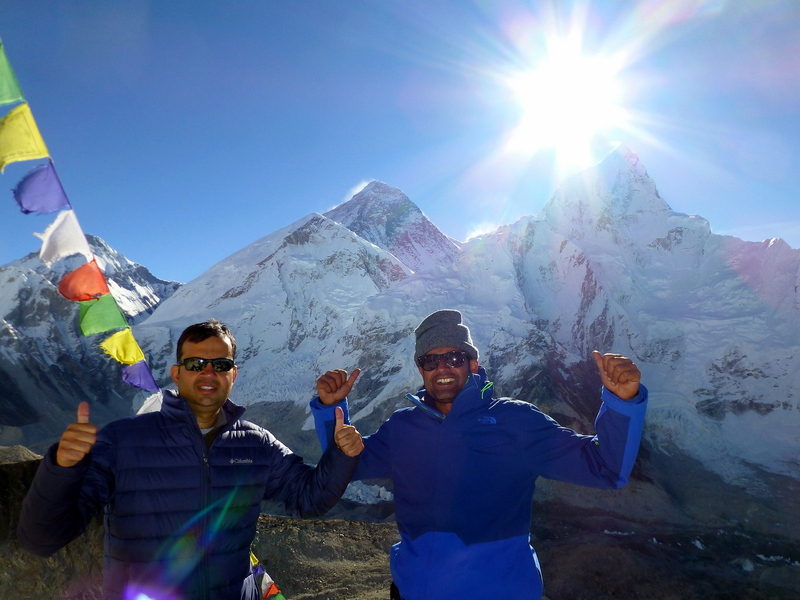 We witnessed it every day since we left Namche Bazaar so the best and safest plan is to visit the base camp the day we arrive to Gorakshep and Kala Patthar next morning. I would say 90% of hikers do the same. When you see Kala Patthar for the first time while arriving to Gorakshep from Lobuche, it looks very small, rounded hill with a prominent trail gradually going up hill. Don’t get fooled ! The actual peak is not visible from Gorakshep – it’s further up behind the first hill. Taller mountains and vast Khumbu Glacier around Kala Patthar skews our perception of its height and distance making it look like a small hill easy to climb. As I discovered, it is the most difficult trek I have ever undertaken. After another restless night, we get ready to climb up to the top of Kala Patthar just in time for sunrise for beautiful views of Mt. Everest. 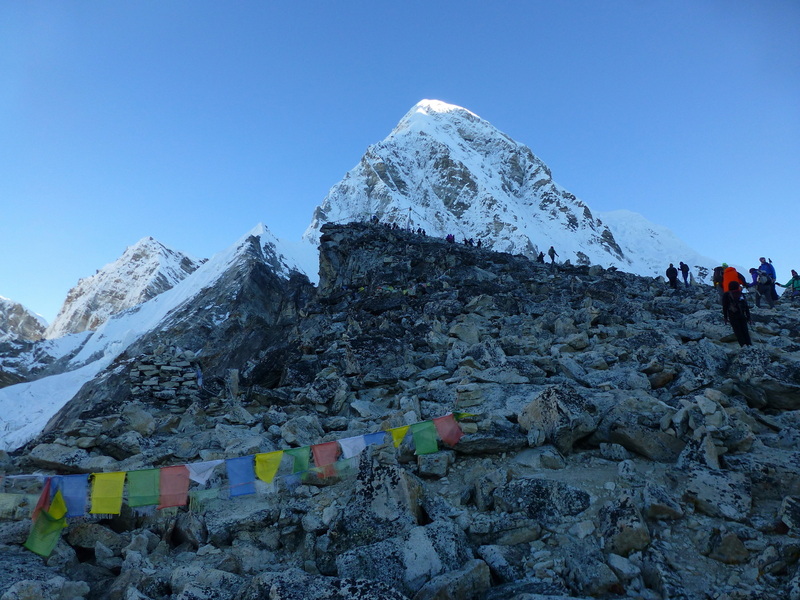 Kala Patthar itself is not at all attractive but it is perhaps the most visited vista point in the Himalayas. 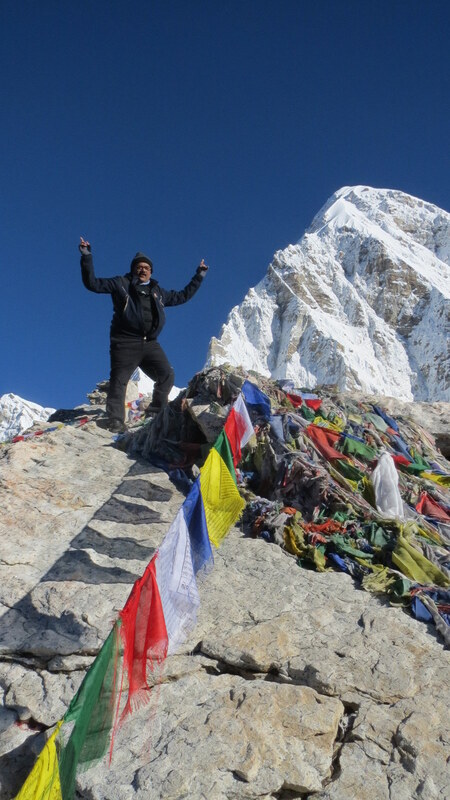 Kala Patthar is the only place from where you can get the best views of Mt. Everest without embarking on any technical mountaineering. It’s just a walk up the hill. 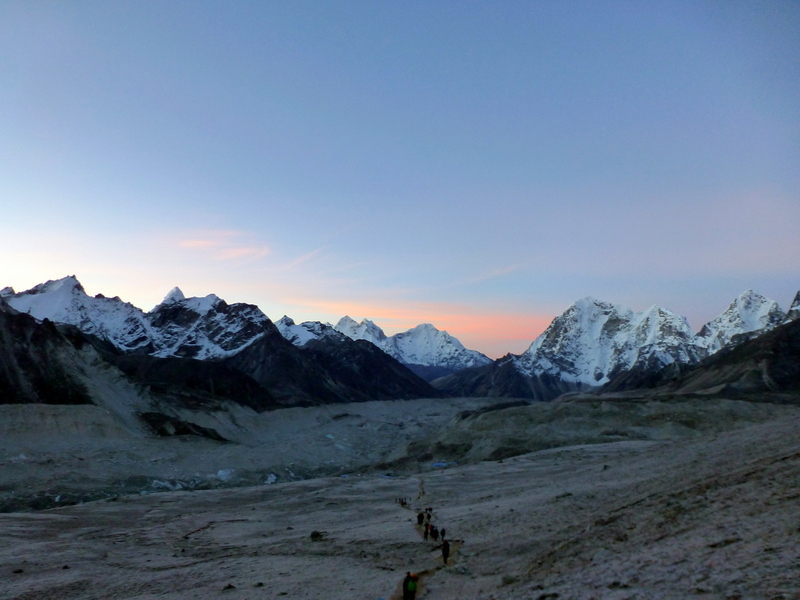 Most hikers start climbing the Kala Pattar around 4 am so they cam make it to the summit just in time for the sunrise. The trail head was not too far from our hotel, we crossed frozen lake bed to a sign pointing to Kala Pattar (there is only one trail from Gorakshep) which goes up the first small hill. The actual summit is on a second hill through a very rocky terrain. Tshering and I started about 15 minutes before our group to get a head start. It was pitch black when we started and I can see a steady stream of hikers with their headlamps turned on going up the hill. I was up all night, haven’t head anything substantial to eat in last 24 hours, and was loaded with Diamox & my daily thyroid medication. In about 20 minutes of hiking, my fingers were extremely cold and becoming numb. My first reaction was that my gloves were not doing its job. I stopped a couple of times to make sure they were sealed properly – which they were. Within next five to ten minutes I was extremely nauseated and felt like I am going to throw up. My stomach was churning (without any food!) and I felt very sick and uneasy. I stopped and explained Tshering what I was feeling and he immediately said it’s an early warning sign of altitude sickness. Since he was constantly with me from day 1 of the EBC trek, he can easily see I was struggling and not at all in my usual mood. He suggested that I should rest for a few minutes, have some electrolyte spiked water and wait to see if it goes away. After resting on a small uncomfortable rock for about 10 minutes I didn’t feel any difference. I have never had this type of experience in my entire life and still find it very difficult to explain in words. Immediately, I remembered that women, suffering from the altitude sickness and a panic attack, we met on our trek to the base camp yesterday. Knowing we were just above the first smaller hill and the worst trek is yet to come, I made the most difficult, but perhaps the wisest, decision to not continue and return to my room. Tshering offered me to come back with me to the hotel but I said I can manage on my own thinking he may be needed to assist others in our group. On my return trip I met others from my group and informed them – in a few words – that I am not feeling well and going back to the hotel. This was the end of my trek to Kala Pattar. The following account is based on what others in my group shared with me after the trek. Trail leading to the Kala Pattar peak. The trail leading to the peak was through the scattered rocks. After I turned back, Kamlesh also felt he was struggling and took many breaks. Towards the second half, he took one step at a time with break in between each step. Tshering accompanied Manubhai and Kamlesh to make sure they were OK and assisted them when needed. Both of them reported it was extremely difficult to hike the last part with plenty of rest breaks. Manubhai near Kala Pattar summit. They made it to the top just before the sunrise and joined all other hikers to view beautiful sunrise over the Mt. Everest. Here is a sequence of pictures of Mt. Everest during sunrise. The sun rises between Mt. 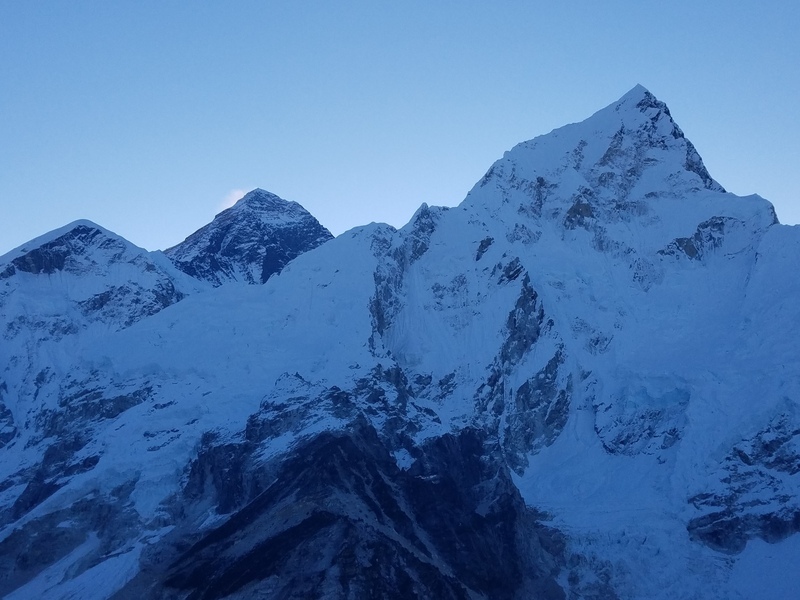 Everest and Nuptse, the smaller peak on the left is the west shoulder of the Everest. 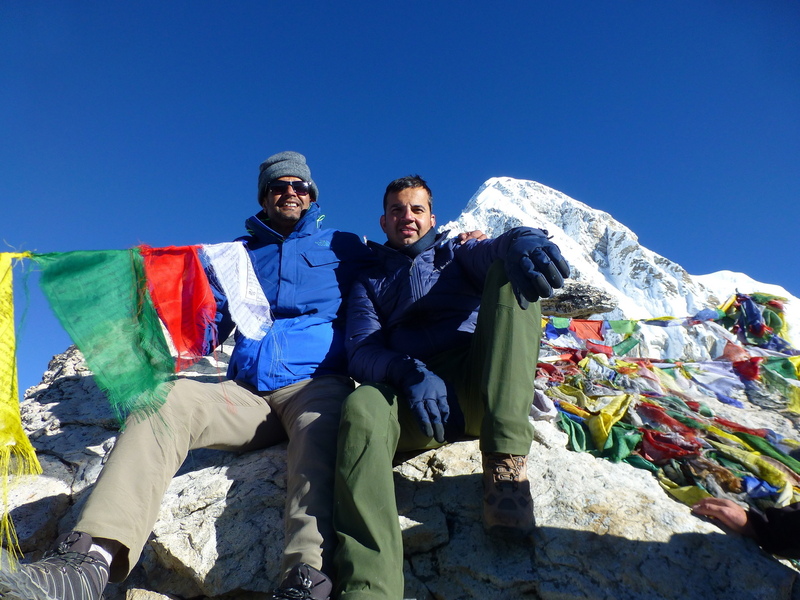 There was a celebratory environment at the summit during sunrise marking the final and most difficult achievement of the entire EBC trek. 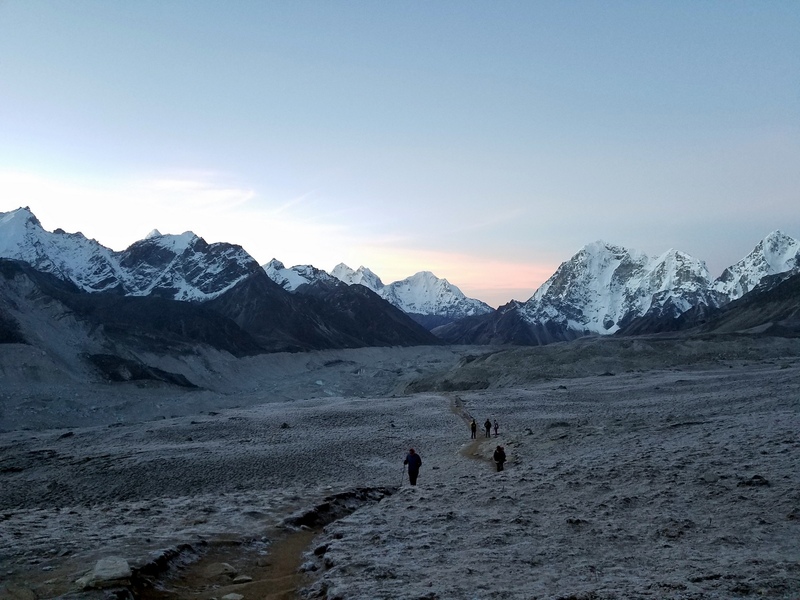 Hikers congratulated each others and captured the magnificent views of the Everest range during a beautiful sunrise with clear skies in many photographs. 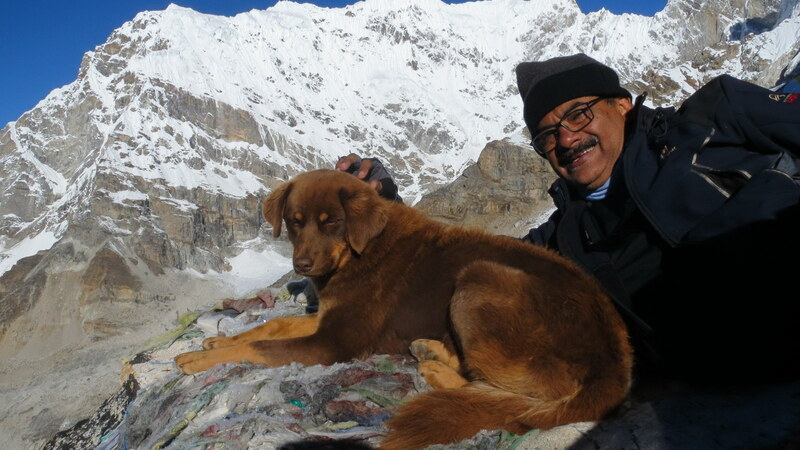 Dr. Dipak made another canine friend at the summit (the first one was during our acclimatization hike to Nagarjuna summit from Dingboche). 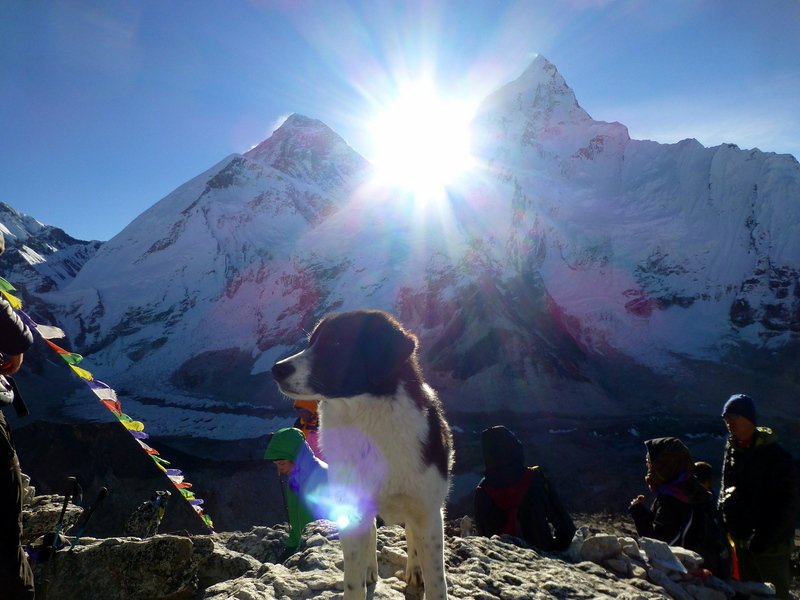 There were two friendly dogs accompanied some hikers to the summit. 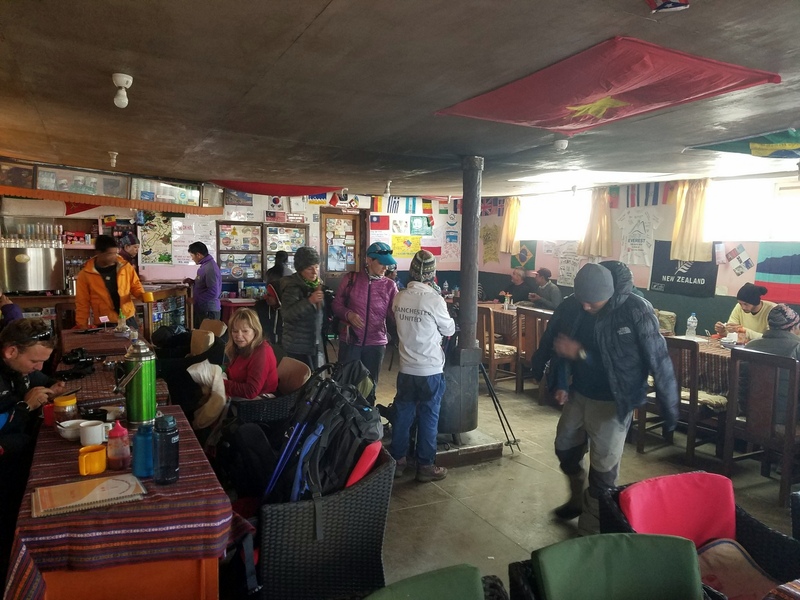 After our team returned to the Yeti Resort, we had a nice breakfast before packing our stuff for a helicopter ride to Kathmandu via Pheriche and Lukla. After coming back to the hotel, I realized that my backpack (with my room keys) was with Tshering so rested in the dinning room sipping some warm ginger tea. Amazingly enough, within 15 minutes I was perfectly alright! At that point, I thought about going to Kala Pattar but realized that do not have enough time to return in time for our helicopter ride back to Lukla. 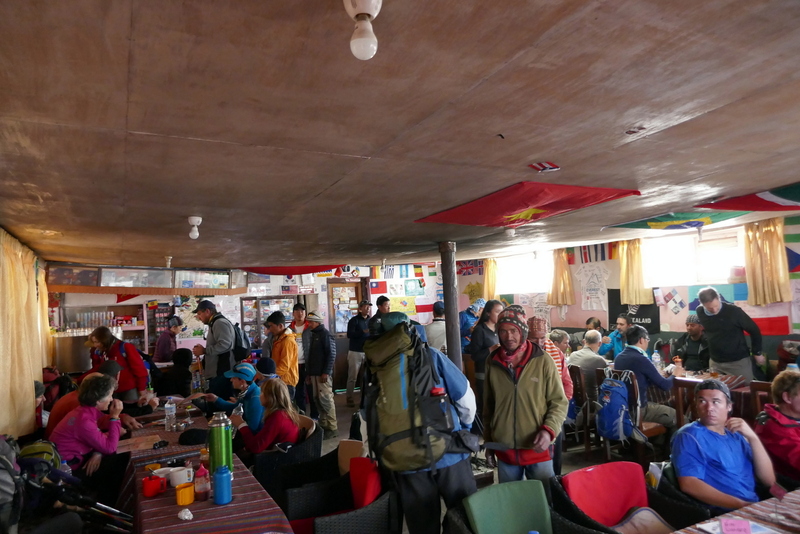 I spent time in the dinning room chatting with other hikers and sherpas getting ready for the return trek to Lukla. 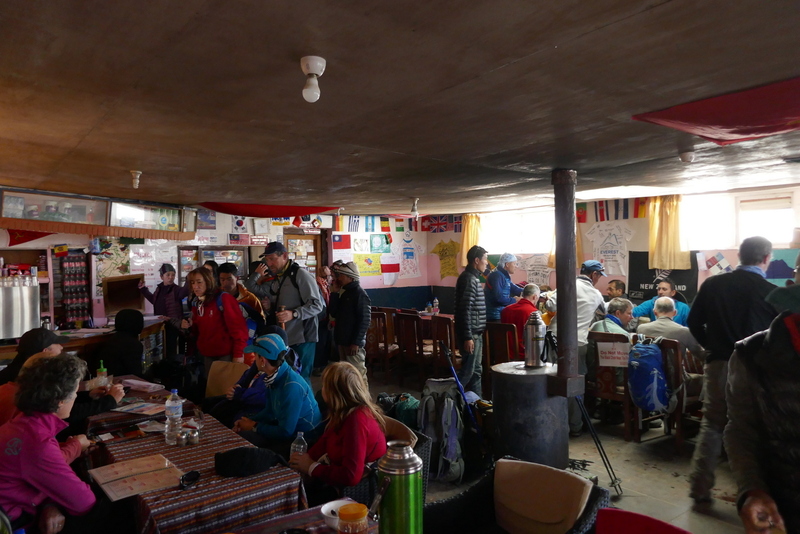 I met Bea from Brazil whose husband got sick at Dingboche so she continued alone with a guide. She was on her way back to Lukla. I also met a group of hikers from India who were getting ready to check out the hotel on their return trip to Lukla. The women we saw yesterday suffering from the altitude sickness was in their group. I learned that she was a medical doctor and after resting through the night she was alright for her return trek. After breakfast, we checked out of our rooms and waited in the hotel patio before heading out to the helipad for our return ride to Lukla via Pheriche. Our guides were in contact with the helicopter company to coordinate the flights. 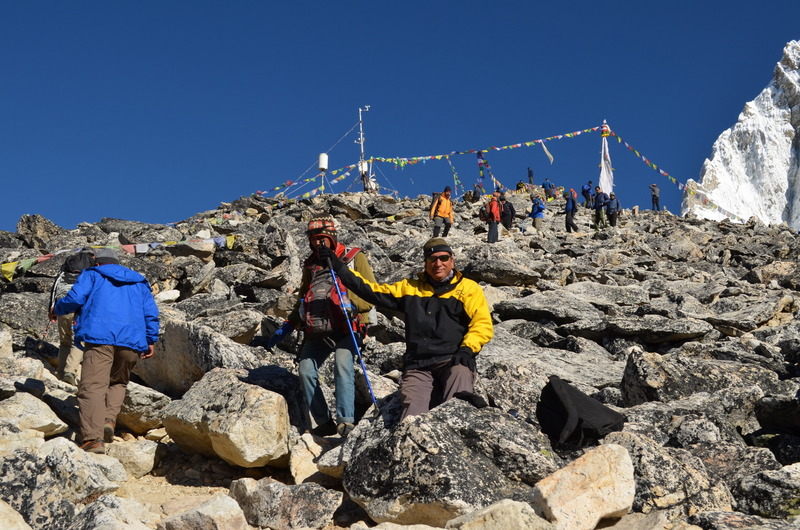 Due to the thin air at this elevation, we were told that the helicopter will shuttle between Gorakshep and Pheriche with one or two people and some luggage at a time. Our group at Yeti Resort after breakfast. Waiting for our helicopter ride back to Lukla. Next: Gorakshep to Kathmandu via Lukla.